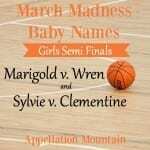 Just one short year ago, we launched March Madness baby names 2017, a contest that ultimately resulted in gentle nature name Wren joining the elite group of names that have been voted readers’ favorite over the years. In order to enter the contest, a name must be among the most-viewed in the prior calendar year. That makes for a quirky set of contenders, mixing pop culture favorites with headline-worthy choices and a few steadily great names, too. A few of these have competed in prior years. 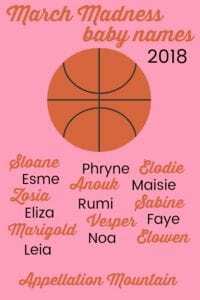 Sabine, Anouk, Vesper, Elowen, and Faye are among the names that started out in our 2017 contest, too. 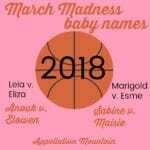 But some are making their debut in 2018’s March Madness, most notably the regal Leia. Following Cora’s back-to-back wins, we decided that no name could defend the title. That means that a few names were ruled out of this year’s competition. But there’s no shortage of contenders. 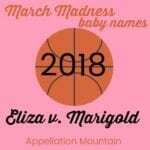 Let’s take a look at this year’s contestants, and get ready to vote in the March Madness baby names opening round: girls’ edition! Two international mini-names compete, the name of Beyonce’s new daughter versus a literary French twist on Anne. Two rarities face off: Phryne of Miss Fisher’s Murder Mysteries fame, and the glittering, international Sabine. 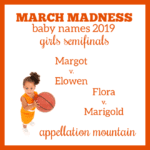 Up-and-coming nature name Marigold squares off against the lovely, French Elodie. Call it the space race: Star Wars heroine Leia takes on Vesper, the evening star. Quirky Zosia or classic Eliza? Two modern favorites duke it out: sleek Sloane and romantic Esme. Sassy, sweet, and retro, too! They sound like sisters, but you can only choose Maisie or Faye! Lively Noa takes on gentle Elowen. The Opening Round will narrow the sixteen favorite names to eight. We’ll then proceed to four, and finally two names, which will face off in the Final Round on March 24th. Voting will remain open through Thursday, March 8th. Check back on Saturday, March 10th for the quarter finals round and see which of your favorites advance. Any guesses as to which name will win it all? Marigold ❤ That’s easily my favorite and hope it wins! It’s easily my favorite as well, but I’m hoping it doesn’t win, because I don’t want it to rise (for reasons)! What a beautiful crop this year! Anouk, Vesper and Zosia are my faves, but my money’s on Elodie or Esme. Elodie is my favourite here, but I predict Esme will win. Great start to March! Thanks, as always. My eye is on Esme, too! 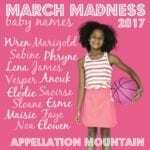 Elodie has been in a BUNCH of March Madnesses, and always gets knocked out. Don’t know why, because I love it. Elodie versus Marigold?!? Talk about impossible to decide! Zosia reminds me too much of Zoysia, a type of grass.